In a previous post, I discussed how to use Final Cut Pro X Color Board presets. For that post, I created a set of presets and made them available as a free download. That remains one of the most viewed blog posts I’ve written and literally thousands of readers have downloaded the presets. In this post, I’m doing much the same with Adobe SpeedGrade CC Looks. Adobe SpeedGrade CC uses the Lumetri deep color engine and presets may be shared between Premiere Pro CC and SpeedGrade CC via the Direct Link protocol. Grades, LUTs and presets applied in SpeedGrade are combined into a single Lumetri filter effect that gets applied to the clip in Premiere Pro. When SpeedGrade CC is installed, it includes a number of preset Look examples developed by Adobe and Looks Labs. These include stylized grades, film emulations and camera log conversions among others. When you work in SpeedGrade, it is possible to save user-created Looks, as well. These are a combination of any set of layers and grades that you have applied to a single clip. These may include color correction adjustments, but also LUTs and special visual effects filters. User files are saved as .look files with a corresponding .jpg thumbnail of the shot that the grade was originally applied to. 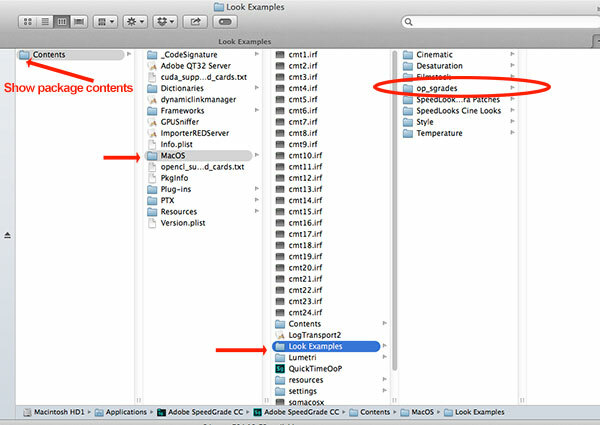 These .look files are saved by SpeedGrade in a number of possible folder locations, so you have to be careful, as to which folder is open and selected when you save a file. I have created a variety of custom Looks covering color treatments, effects, film styles and more. These Looks were built around an image I’ve used for many of my color correction blog posts, because it has a nice spectrum of colors. For example, it’s hard to set up a characteristic “orange & teal” look, when the image has no blues, greens or skin tones. To start, download the file from the link below and unzip the archive file. Inside, you’ll find a folder called “op_sgrades”. Let me point out that my testing and instructions are based on a Mac. I have not tested this on a Windows PC, so I am not sure where the proper default installation folder lives. On a Mac, the supplied Looks styles (Lumetri and SpeedLooks) are inside the closed application bundle. To install this new folder, you need to open the SpeedGrade CC package contents (right-click the application icon and choose “show package contents”). This will expose the application’s Contents folder. From there, navigate to the MacOS subfolder and then the Look Examples subfolder. Drag the “op_sgrades” folder into the Look Examples folder. When you next open SpeedGrade CC, you will be able to access this new set of Looks in the Looks Management pane. On a PC, right-click the application program icon and select “open file location”. This will expose a set of files, including the Look Examples folder. Another caveat to this procedure. What happens with the next Adobe update to SpeedGrade CC? I’m not sure what happens to any folders inside the application contents package during an update. It may be that you would have to install this custom folder into the Look Examples folder again after a SpeedGrade CC version update. We’ll see when the next SpeedGrade CC update happens. If you look back at my FCP X Color Board Presets article, you may notice that those looks were more extreme. In this set, I stayed more subtle, but the presets will be more complex, since SpeedGrade CC permits built-in effects. Some of these may be slow to display and update. This is especially true of any that include blurs. Click here to learn how to use these with Premiere Pro CC 2015 and the Lumetri Color panel. Click here to download a .zip archive file of the Looks presets. Click on any image below for a slideshow of the various Looks. This entry was posted in color grading, editing and tagged Adobe, color grading.